Hello. 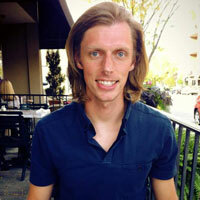 My name is Eric Tarr. 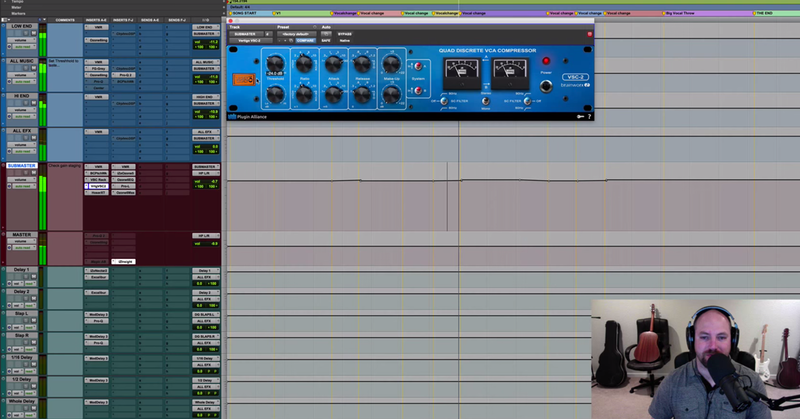 In this video, I’ll be demonstrating how to set up mix buss compression on two or more submix busses. It used to be that a mixing engineer would send a single completed full mix on to the mastering engineer. 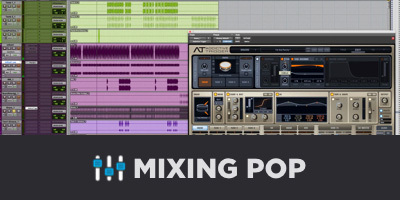 Now, it’s becoming more common place for the mixing engineer to print individual stems of different groups like vocals and instruments separately. If you’re a mixing engineer that likes to mix into buss compression, this kind of scenario can be difficult, because you like to use a compressor that responds to the entire mix, and glues everything together. However, if you’re supposed to keep your stems separate, you cannot just simply insert a compressor on your vocal stem and have it automatically respond to the full instrument and vocal mix. Here’s an example. Let’s say I have this pop rock song with the vocal and instrument subgroups over here. I’ve got a buss compressor inserted on my mix buss. It sounds like this. You can see that when I’ve got my instrument group and my vocal group routed to my mix buss, that the compressor is responding to both of these signals. However, if I want to just print my vocal buss separate from my instrument buss, I could do something like mute my instrument buss over here. Now, when I press play, or if I were to bounce this to disk, the instrument group is no longer going to be hitting the compressor, so the compressor only responds to just the vocal buss. You can see that happening here. The metering is going on my instrument buss, but the compressor isn’t responding until the vocals come in. Now, the compressor is going to be applying gain reduction to my vocals differently than if I had the instrument buss going through the compressor as well. Here’s a technique that I came up with to set up mix buss compression on two or more submix busses by using side-chain compression. To begin with, let’s say I want to use the API 2500 as my mix buss compressor. I need to setup the side-chain signal composed of both the instrument and vocal subgroups that I can feed into the key input of the plug-in that’s going to trigger my compressor. There’s many different ways to go about doing this. Here’s one method that I came up with that works for riding the signal inside of Pro Tools. The first thing that I did was create duplicate version of my subgroups: one for my instrument group, and one for the vocal group. I’m going to be using these for the side-chain though. I’ll mute the original ones now, I’ll come back to these in a second. So, my side-chain groups have an identical input to my originals. The only difference is that the output instead of going to my main mix, it’s going to a buss that I call the mix side-chain. This is going to be the buss that eventually feeds the side-chain of my mix buss compressor. So, these signals are being blended together at this buss, and eventually being routed over to my compressor. For now, what I’m actually going to do is setup a temporary buss where I can monitor the side-chain signal, and listen back to it, and copy the compressor over just temporarily, so that I can dial in the settings that I want, based on listening to my side-chain signal. So this is being routed to the main mix. So, I know for my mix buss compression, I want to have kind of a medium slow attack, a low ratio, and a medium release. Then it’s just a matter of dialing in a threshold that I like based on the input signal. So, that’s the effect I’m going for. Very subtle, but not too much compression. Alright, so I’ve got the signal right now – the side-chain signal going into the compressor. What I’m going to do is actually move this back over to my mix buss now, and then setup the side-chain signal going in here. The one thing that’s tricky about this is that Pro Tools only allows you to have mono side-chain signals, or mono key inputs. So you can’t do this perfectly, but for the most part, you can get almost all the way there for what your intention is for doing. So, I’m going to go in here for the buss, find my mono. I’m going to just by default decide to choose the left one, but you could choose the right one and it would be the same thing. Alright, so now I have the signal being routed from my mix side-chain over here to the compressor. What I’m actually going to do is mute this so that it’s no longer going to my main output. I’m going to just pan these to the center so that what my compressor sees is a signal that’s balanced from the left and the right both going out the same channel. Okay? So, if I press play right now, there’s no signal that’s actually going to my master fader, but you’ll see the compressors responding and applying some gain reduction. Alright, if I bring back in my mix of both the instrument buss and the vocal buss, you’ll hear the compression taking place that’s occurring because of the side-chain signal, but affecting the vocal buss and the instrument buss together. Now when I go to print one of the instrument stems or the vocal stems, I can mute the output of my subgroup, but have the compressor still respond to the full mix. So here’s an example, I’ll mute the instrument buss. Watch the compressor. The vocals won’t come in for a little while, but you still see the compressor starting out at the beginning to show that it’s responding to both the instrument and the vocal. So there you have it. This is how you can setup mix buss compression on two or more submix busses.